The Isthmian League is one of the oldest surviving Leagues, having been formed in 1905 with a dedication to amateurism that, for many years, resulted in its champions not even receiving a trophy for their efforts; the honour of glory being deemed as sufficient by the League’s administrators. This philosophy, however, meant that the League was seen as the poor relation of the Southern and Northern Premier Leagues, despite consistently proving itself as one of the strongest in the country. Things began to change in the 1970s when the Isthmian League accepted the inevitable and finally succumbed to professionalism and, in 1973, Horsham were one of a number of sides who switched from the Athenian League to create a second division and, five years later, a third division was added. Although it wasn’t until 1985 that it’s champions were given a promotion place to the Football Conference, the Isthmian League has often been seen as something of an innovator; the first to introduce three points for a win, instigate the use of goal difference instead of goal average, the first outside the Football League to become a limited company and even experiment with an alternative to throw-ins – the kick-in! In 1973, the League become the first to receive sponsorship and, from this period on, the Isthmian League was to become more commonly known by the name of its official backers. Currently the Ryman League, it has previously been known as the Rothmans Isthmian League, the Berger Isthmian League, Servowarm Isthmian League, Vauxhall-Opel League, Vauxhall League, Diadora League and the ICIS League. Life in the Isthmian has not always been plain sailing for the Hornets. The first few years saw some consistent form in which they finished outside the Second Division’s top ten just twice (1975/6 and 1977/8) and a then highest position of fifth followed in 1978/9 before financial problems threatened the football club’s very existence. That they were able to field a team at all for the 1979/80 season was down to the selfless dedication of chairman Frank King who saved the club from bankruptcy and dissolution. A young, amateur team inevitably finished the campaign bottom of Division One, suffering relegation to the new Division Two. Battling against their financial problems, the club endured some dark times under numerous managers in the 1980s, finishing bottom of the league in 1983/4, and when this was repeated in 1989/90, the club only retained their Isthmian status thanks to a successful two-legged relegation play-off against Letchworth Garden City. Progress was made under the management of Peter Evans before the club once again propped up the entire league in 1993/4 under John Yems. This led to the appointment of former captain Mark Dunk as manager and he steered his side to the Division Three championship in 1995/6, only narrowly missing out on successive promotions the following year. But his departure in 1997 saw the Hornets endure three years of lower mid-table obscurity before former Crawley Town boss John Maggs took over as manager in January 2000. After taking a struggling side out of the relegation zone in 1999/00, the following season saw a seventh place finish achieved. Horsham were then runners-up in Division Two in 2001/2 and, following a re-organisation of the league, found themselves in Division One South in 2002/3, finishing eighth. 2003/4 was a year of struggle as teams competed to win places in the newly restructured non-league pyramid and the club finished fifteenth, thus finding themselves in Division One for 2004/5. That season again saw a strong promotion charge fade away, with Horsham finishing third and losing a promotion play-off final to Bromley at Queen Street by 3-1. Promotion to the Premier Division was finally achieved in 2005/6 with the club finishing runners-up to Ramsgate on goal difference. The club’s first ever season in the Premier Division saw a creditable 8th place finish attained and the following year only injuries and a late loss of form denied them a promotion play-off spot for promotion to the Blue Square Conference South. While that 2007/8 campaign was also notable for the historic run to the 2nd round of the FA Cup, it marked the end of an era as the sale of the Queen Street ground – home to the football club for more than a century – left the club facing a nomadic existence, contributing to their eventual relegation to the County League. 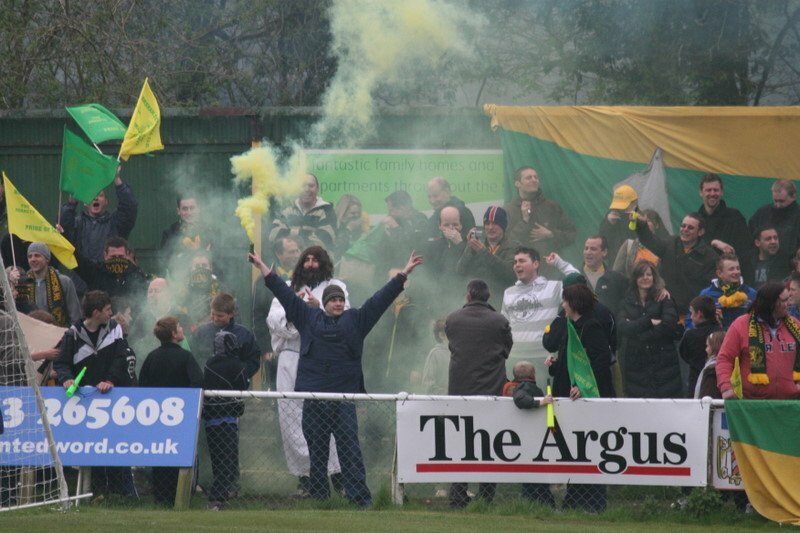 Just two seasons later, and now sharing YMCA’s Goring’s Mead base after a season at Worthing, financial cutbacks saw Maggs and Horsham part company and an inevitable – and unsuccessful – battle against relegation followed. Simon Colbran, installed as the club’s third manager in six months towards the end of that campaign, managed to stabilise fortunes on the pitch but his resignation midway through the 2012/13 programme, saw club legend Gary Charman put in charge of team affairs. It was, though, a testing time in which to cut his managerial teeth and with no significant improvement on results he was replaced by Antony Storey and Cliff Cant but, despite an impressive start, they were unable to save the club from demotion back to the County League for the first time in 64 years.